I have vivid childhood memories of walking home from the bus stop, my backpack feeling so heavy – the day feeling so heavy on my mind. As I opened my front door, the weight would lift. Windows were always open with light pouring in the house, bouncing across clean surfaces. Home felt good, like getting to breathe fresh air indoors. And why do I say clean enough? Well, as much as I admire my mom and my grandma, I don’t have enough time to vacuum every day. I stressed myself out at the beginning of married/mom life trying to be perfect and I can tell you first-hand: that was no way to live a happy life. I developed this cleaning routine when my twins were babies in 2005 (they turn 11 soon – cue tiny violins! ), long before I was a professional organizer or thought about what I could blog about. I actually developed this to limit how much I cleaned – specifically to calm those voices in my head that were saying “maybe you should be vacuuming instead of ___”. Remember the examples in my life of how much a homemaker was supposed to clean? I needed the routine as a a limit, but the cleaning routine works both ways, it can also help you clean enough, if you are prone to not cleaning very much. Now, are you thinking GET TO THE CLEANING ROUTINE ALREADY, ENOUGH WITH CHIT-CHAT?!?! 9 out of 10 is good enough. Perfect is for people with endless amounts of time. If you are going to embrace a cleaning routine, you are going to give up the idea of perfection. It is actually very easy to keep a home at a 9/10 cleanliness level, but to go from 9/10 to 10/10 takes sooooooo muuuuuch mooooore eeeefffoooorrrtttt. So we are agreeing to take it to the 9 and stop there and be happy because there are pursuits in our lives that are meaningful and those deserve our time too. We give cleaning the time it deserves and no more. Got it? I usually laugh when someone comes to my home for the first time and is shocked by how something isn’t as perfectly clean as they thought it might be (usually these people only KNOW I’m a professional organizer and haven’t actually read anything I’ve written about balance). On any given day you may find grass brought in from the yard or a crushed Cheerio anywhere on my wood floor. Stop wearing your glasses if necessary. Make an agreement with yourself that if you follow through with your routine, you don’t have to worry in between unless something has true urgency. A few leaves brought in from the yard = not urgent. A pile of pee from a potty-training toddler = urgent (don’t be jealous). If it is no big deal to clean something up, then sure, do it right away – that just makes sense. 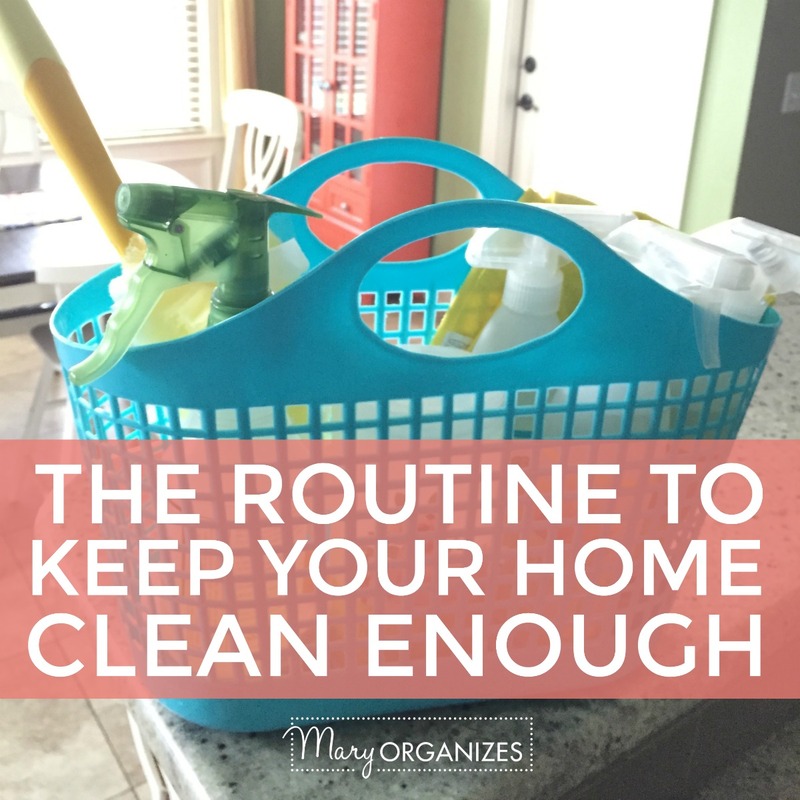 What I’m saying here is don’t re-arrange your day or life to keep your home perfectly clean! Let yourself relax and feel at peace with the floor because next week you will vacuum again and if the leaves wait until then, it will be okay. Catch-up goes on hamburgers only. If you miss a day of dusting, wait until that day comes around the next week to dust. The cleaning tasks you miss each day don’t roll-over to the next day – the deadline expires until the same day next week. Rolling cleaning tasks over makes them build up to an insurmountable amount that makes me want to hide under the covers thinking about. If you are new to a successful cleaning routine, please trust someone who has been there and done that to tell you – skipping a week of dusting will have much less of a long-term impact than overwhelming yourself with expectations of perfection will. This no-rollover method will actually result in your house being cleaner more of the time. And now you’re thinking … wait, what?!?! If you expect yourself to do it ALL perfectly every week, you will have so many weeks that you just can’t do it at all and you’ll start forming a mental block (this is how many people find themselves surrounded by a messy house when always had the intention of cleaning – and I know, because many of these people become my clients), versus the weeks where you allow yourself to skip things and do it imperfectly, where you will actually get a lot more cleaning done. It’s a head-game, as most things in life really are. So, when life gets crazy, and despite your best efforts, you can’t vacuum the whole house, vacuum what you can and do the rest next week. Do what you can. Dust what you can. If you are sick or on vacation, or working on a huge project that is taking all of your focus, then maybe dusting or whatever chore isn’t going to happen at all today. And when the week comes where you can do a more thorough job, then do it. Shift your mindset from saving it all up for a big catch-up day, to doing what you can week by week. Most weeks you should be able to just do your chore, but don’t be blind-sided when it doesn’t go as planned and stop all good momentum. Let’s say you are taking my advice above and not playing catch-up, so it’s been a month since you’ve vacuumed … THEN SOMETHING IS NOT WORKING. Don’t get stuck in a rut, play with the routine and your schedule and move things around until it works. I suggest a routine to get started (below), but do not be afraid to adjust and adapt to fit your schedule. Delegate or Try to do everything for everyone and wonder why you feel grumpy all the time. I have four kids and I let them help me clean, and I honor their effort and my time by not re-doing all of their chores for them. Do they hang the hand towels as perfectly as I would or arrange the pillows on the couch like I would? Absolutely not! But everything they do is one less thing I have to do. Can I get a hallelujah from every busy mom out there?! And I am crossing my fingers that one day they will empty the dishwasher and put things away where they *actually* go. But oh well, the dishwasher is emptied without me doing it and I eventually find what I need when I’m cooking … it’s usually somewhere in the kitchen still! Husbands/Spouses should also be sharing the workload, but it isn’t the same thing as with children, where you just tell them what to do. There should be discussions and agreements about shared responsibility ahead of time – not in the heat of the moment of wanting something done. I suggest starting these conversations with each adult saying their *favorite* and *least favorite* things to do, so that those things can be accommodated if possible, and everything else can be a compromise. Laundry is a separate beast than cleaning, except it kind of isn’t. You can’t ignore it, or just keep moving piles around. Now is the time to conquer it too. For more info on making sense of Laundry – Read Beyond Killing the Laundry Monster. I’ve added laundry to the cleaning routine because it really only makes sense to look at it as a unified package. I could separate it out … but then I’d just keep trying to look at two lists trying to put it back together again, wouldn’t you? Chore: *From HH List – This is how we keep up with Annual Maintenance. I like to leave my weekends open for life to happen. I use my Saturdays for projects and yard-work, and I like to rest on Sundays. You are in charge of your routine – so adapt this suggested weekly schedule if it doesn’t fit your life. The Daily Habits will make the biggest difference in making your home feel clean day to day. If you have to choose between these or your Cleaning Routine on any given day, do these first. These are the foundation to making everything else work. But whew! Can you imagine if you really just started doing this today and never looked back? Your home and life would never be the same … in a very good way. I’ve tried to implement a similar schedule; however, I have not been consistent. What about the laundry? How do you do all this if you have little ones? I have three under age 4. I wish I could hire you! I need a system that works to do everything in my life. My twins were one when my third daughter was born, so I know a lot about what you are going through right now. Make sure you are following the non-accumulating method, because it can be very motivating. 🙂 I spread my laundry schedule out like I spread my cleaning. Let me know if you’d like to work with me and I’d be happy to help you create a custom plan for your needs right now. Good luck! The time passes quicker than you think! Hi Oslyn, I read your concern. It’s really a hard time cleaning when you have little kids. If you really find it difficult to work on cleaning routines you can also have a choice of hiring domestic cleaners that can do it for you. You can also add some tasks like laundry, washing dishes and anything you like on a regular basis. I hope I have given you another idea. If you can make it happen, getting help can be great! People have critizited me for my laundering habits. The truth is it will always be a struggle. Laundry and dishes are never ending. I have now come to a pretty consistent routine of when the clothes come off they go in the wash. I do not use bleach in my house, because I don’t like it. I use it clean in every load and I was all my clothes together and I mean everything! Kids clothes, baby clothes my clothes and towels get wash every night. I try to have them folded and hung in the laundry room. If you do not have a place to hang things Wal-Mart or Amazon sells rolling ones cheap. I stack all the hanging items flat not folded and get a stack of hangers as I put the hanger on each one I fold the shirt or whatever towards me before I know it I am at the bottom of the stack. Since I have found an easy way to hang I hang as much as I can. Pants I do in a separate stack quickly as well. And all my tanks a bras go on a special hanger with lots of hooks from the dollar store (kinda looks like the key hanger that goes by the door, only on a hanger). This way I can see everything and my drawers don’t get messy. Infest in things that make organization easier. Good luck! I love your blog and all the success you have cleaning! Mary, great post! I have tried so many times to get on a cleaning routine. My house is a disaster. Working full time and having a toddler makes it so hard. We usually end up spending half the weekend cleaning and that is never fun. In the evenings I am busy making dinner and playing with my son before bedtime. The last thing I want to do at 8 pm at night is start cleaning 🙁 Any suggestions? Well, you may have answered your own question — “It still seems like I’m always cleaning!” My system is where you do your chore each day and then move on, maybe occasionally having bigger projects to do on the weekends, like clean the windows or baseboards, but on a regular basis, you do your chores every day and there is no hours at a time on the weekend necessary. Mary, this is the second time I’ve come to your blog to look up this exact post. I think this time just might be the time I’ll actually put it into action. Thanks! I love you, Mary. You inspire me!!! Awwww!!! You are the best!!! So I am glad I took a look, because it really is simple and realistic. I think a lot of us put too much pressure on ourselves to have a spotless home (life) and part of your advice is to let go of that pressure and enjoy living! This is especially important for me, because I suffer from fibromyalgia and chronic pain due to a back injury. I simply cannot clean like I used to! Its very hard to not be able to do more than one or two rooms or tasks on a cleaning day! And because I am also very perfectionistic, if I cant do something properly or enough, its very frustrating and defeating. I really appreciate that part of your advice is to give yourself a break! Thank you so much for sharing with us all! But in all seriousness, doesn’t a live-in housekeeper sound amazing?? Thank you Mary for your post. You hit the nail on the head for me. I have to have perfectly spotless and deep cleaned home before I allow anyone to visit. I love the weekly schedule too! It totally makes sense. I try to schedule a cleaning day and it has ended up being on the weekend (I would rather have family time). I am going to try your schedule because I think it will be easier to accomplish being a homeschool mom. Thank you! You’re welcome! I’ve been on a similar journey. There is so much freedom in letting go of perfect! Totally agree with the remark about someone judging you based on the lone Cheerio on the floor. Those people wouldn’t make good friends anyway! Most people judge out of their own securities. It is sad. Of course, we are allowed to have boundaries and not force friendships with people who make us feel bad about ourselves about less-than-perfect houses. Thanks so much! And thank you so much for sharing!! Thanks for sharing! No matter what way you do it, regular cleaning is the way to go. Although I do indulge in an occasional cleaning service. That’s a real treat! Thank you! Just start today! And don’t let your list build-up! decllutter your home in 91 days. I would like to read about that. I’m starting to put 3 tubs in a room for keep, give away, and throw away. So far, I have one room completely done. I am so proud of my self. Thank you for this! 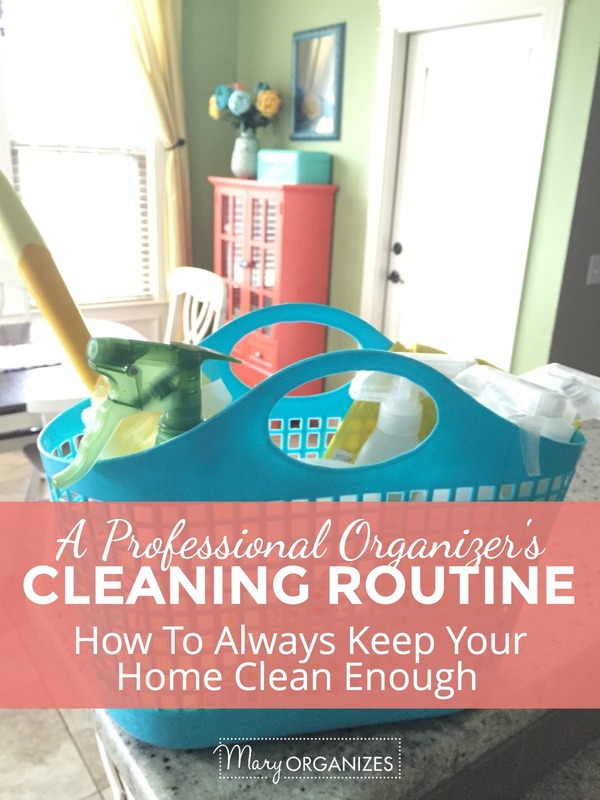 I am a chronically disorganized person who dreams of having a clean house all of the time. After massive build-up, I am a oh-my-gosh-i-can’t-take-this-anymore cleaner and don’t stop until it’s all spotless. The all or nothing cleaning frenzies are just not healthy. I am a stay-at-home mom with a 9 year old and teenager, so no baby is keeping me from doing it. I think I just may spend sooooo much time in the home that I walk past everything. But, I hate that I allow it to build up. I find it rather odd that a clean, organized home with clean bed sheets and windows is like a dream come true— but I’m not even capable of attaining it regularly. I’m sick of the extreme– and maybe a little at a time might just work. I will print this and post it on the fridge. Now remembering to look at the fridge and start the program is the next challenge! I always try and be a cleaning service for a day. I think your plan of going through the jobs one per day would work better. My kids would like that better too! I’m 53 years old. From the time I was a child I loved to clean. There was ALWAYS something I could clean. No matter how clean my house was though it wasn’t clean enough. Now all of a sudden over the past 8 years it seems as though I’ve forgotten HOW to clean. I don’t know where to start or even what to do. I have cleaned this way for a very long time. People think my house is always clean, but it is just always maintained. I also have a “yearly” cleaning schedule and rotate the big jobs several times a year, such as cleaning the tops of my cabinets, etc. I have found that by doing one of these big jobs on a rotating schedule, they take very little time and everything is acceptably clean. I will vouch for you on this Mary. 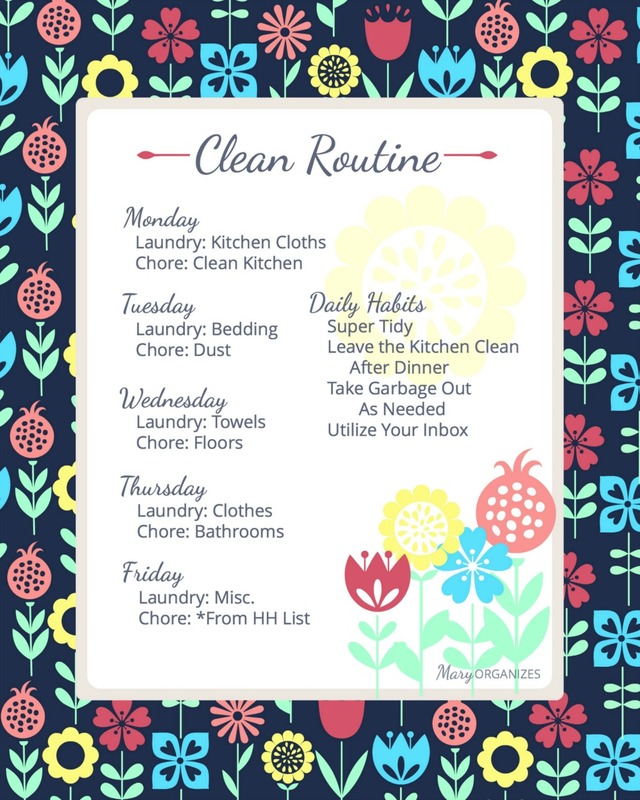 This is hands down the absolute best May to keep a clean home, and you are right, if you miss a week or a chore, just wait til next time to do it. It is so much less stressful to keep your home up and people will truly wonder how you do it. Thanks for the endorsement and I agree! It works! I always do my bedrooms the same times I do these other chores. So I dust the whole house on dusting day and so on. I want to implement this! I’ve been laid up so long I have forgotten how to clean. I will start planning today so I’ll be ready for tomorrow. Hire a neighborhood teen to come and do some things during the week. They are a lot less than merry maids. I pay $8 an hour for 2-3 hours a week. It is very helpful. That sounds like a great arrangement! Great cleaning routine! I promised myself that I will separate my duties. It is the best option if you don`t want to be overwhelmed by cleaning. Thank you for sharing your post! Best regards! Yes, much better to separate and avoid feeling overwhelmed! Sentimental items can be the hardest to declutter, but try to remind yourself that stuff is stuff, and that you get to keep your memories no matter what. You can do this! Awesome post. Totally agree with the clean enough concept. Thanks for sharing this. 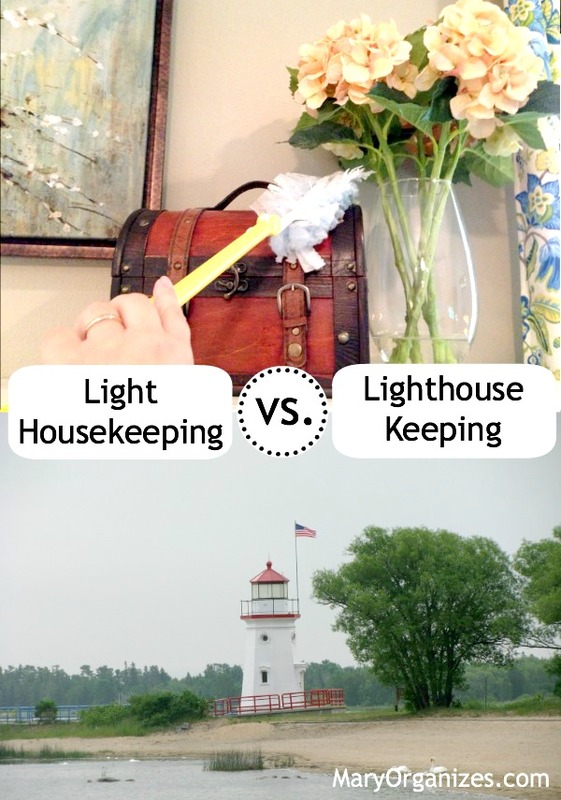 The advice about rating tasks with how urgent it is to clean them up, and about how there isn’t roll over or “catch up” days when it comes to cleaning is especially useful. I’m guilty of procrastinating on things then trying to do it all at once on the weekends! Yes, and that can really ruin the weekends – this way is much more fun! hello, my english is not good because i am a braziliam off course hi hi hi, i only come to tell you, thank you! i think now i can have a house enough clean and time for my kids and my craft projects! thank you for share your time and your talent with us here on Pinterest, it is wonderful for woman like me have people like you around here! You are so welcome! I’m glad you found the blog! Thank you! I’m 19, living with my fiancè in a TINY apartment. I work 8-5 monday through friday and he is 7-4 and then 4:30-8:30 (has 2 jobs). We both have a lot of stuff and not enough space, especially when it comes to clothes. Every time I come home I’m exhausted but there is stuff that needs to done. Like dishes, or trash needs to be taken out or laundry needs to be done, or clothes put up. I also try to fit in about an hour and a half at the gym because I’m trying to lose weight for the wedding. I’m just having a really hard time maintaining a clean apartment whenever we don’t have the space to put everything in it’s place nor do I have the time to devote to finding it a spot. I barely even get dinner cranked out in enough time before he comes home from work for the night. And by the time I finally get dishes washed and clothes semi-put up he’s already asleep and I’ve barely spoke to him. This is starting to cause a lot of problems in the relationship because I’m always three steps behind what I should be. I just need some advice on how to keep a clean home, grocery shop, find time to work out, and spend time with my S.O and get at least 6 hours of sleep. Plus, I just don’t like cleaning because I feel like it’s NEVER ending and I can’t stand that. I love this post. It is so hard to give up on the idea of a perfect home, but necessary for health. I don’t let myself get off schedule unless I have an episode (due to dysautonomia) and am out of commission all day. Even if that means finishing cleaning at 2 am after several minor emergencies. Thank you, Mary. We have just finished the Spring Cleaning Challenge in November. (It is the cooler time of year for Houston and we are done with home school for the year.) I wanted someone else to tell me what to do so I would get it done and not skip things I didn’t want to do. We moved into this house at the end of last year, so I now know have a better idea of what this house needs to stay clean enough. We’ll be tweaking our cleaning routines using some of you suggestions. Thanks for all your help. A quick suggestion/ testimonial which might help some of those who have trouble getting things done each week… Six kids and I are home all day homeschooling. We are able to be off whenever Dad is. It is great. However, because our “day off” is rarely on a Saturday and each week can have a different schedule, I have never been able to get a “weekly” routine to work well. So our cleaning and school days are numbered. Certain subjects are covered on “Day 1” and certain cleaning tasks are assigned to “Day 1” We just rotate through our numbered days regardless of what day of the week it is. This works for me to keep from neglecting a chore for way too long. If I don’t finish “Day 1” chores because they fell on a calendar day with lots of extra activities, then no problem. Next time “Day 1” comes around, it will probably be on a different day of the week which has fewer activities. And if we are so busy with outside activities we are not planning to have a School Day, then yea, no cleaning either. I used this same system when I had small kids and my husband did shift work. I just always had trouble making sure I did chores each day of the week, but having Kitchen Day, followed by Floors Day, then Bathrooms Day, etc. regardless of the day of the week just worked for me. As long as I did one thing on my Kitchen List I would move on to the Floors List the next day. But if nothing got done, I would repeat the same Kitchen List the next day.Of course, if I had been on Kitchen Day for a whole week and still not gotten anything done, I knew I was probably being lazy! Hi Mary, I love you blog! I have a daily list, a monthly list, and a yearly list. Dailies are things/cleaning that I would like to ideally do every day, but if I don’t do all of them, it’s ok, they’re there for tomorrow and will eventually get done. I also have a reminder on my daily list, to do one of the items on my monthly list. These are things like: clean bathroom baseboards (why are they always so dusty!? ), scrub trashcans, scrub out garbage disposal, clean dishwasher, washer and dryer, declutter under one sink or one cabinet, wash my makeup brushes, etc. (the list is a bit long but not overwhelming and these are all quick tasks that I just don’t want to forget to do). I do as many of these items as I can each month but if I don’t get to them all, I don’t play catch up because I start over on the list each month and they do get done. My yearly list has each month of the year and chores divided up amongst those months. I make sure to clean the tops of my kitchen cabinets every other month, or to clean under my stove, fridge, washer and dryer, rotating my mattresses, power washing the big trash cans for the garbage man, washing curtains (yearly cleaning maintenance around the house that doesn’t need to be done every month but maybe bi-monthly, quarterly, maybe just once a year). I keep a reminder on my monthly list to check my yearly list to see what tasks I have for that month and I do my very best to accomplish everything I have assigned myself for that particular month. I divide these yearly items up so only a few fall in each month and at appropriate or convenient times and I can easily get them done. For example, I make sure to completely empty out my kitchen cabinets and wipe down and reorganize in May before my daughter gets out of school for the summer. I keep the yearly tasks to be done during the summer months pretty light so I can spend time with my daughter. I put items I want clean for the holidays on this list to be done the month of November and I give myself December off. My house is deep cleaned year round and the things company may notice are completed so the holidays are more relaxing. This schedule works so, so well for me! My house is deep cleaned, organized and decluttered on a regular basis. I never have to try to remember to do anything, it’s all on my lists according to frequency and my lists all remind me to check the other lists. My brain isn’t cluttered up with trying to remember everything. My house gets messy, believe me, but it always pretty clean. I never have to do a marathon spring cleaning or scramble before the family is over for Christmas to make my house presentable. Sorry for this long comment but you are absolutely right….maintenance mode IS THE WAY TO KEEP A CLEAN HOUSE. I do it and it really does work. My friends think I’m a little nuts but they’re always the first to comment on my clean home and I’m the one they call when they need help. I get so many new ideas from your blog! And this post gave me reaffirmation about how I maintain my home! Thanks for sharing your lovely ideas and the sneak peeks into your cabinets and drawers! I love seeing how others keep things organized. Thanks for sharing!! I love to hear about your success! These are great tips. Starting the day with just a few things makes such a big difference! Thanks for the inspiration! So true. Thanks for visiting! What do you mean by “utilize your inbox”? Great info! It’s very informative topic. Thanks! Very informative post! As perfectionist myself, I understand how important the house cleaning can get. Letting someone help every once in a while can be actually liberating, however, such an act can require an enormous amount of self-control. Also, love the design of your printable cleaning routines! Yes, I love hiring help from time to time. So liberating! How to remove burnt on oil and grease on the bottom of a frying pan or saucepan or what has anyone got any tips for an easy clean as I have arthritis in the hands thank you. Would you have any plan to give a detailed post on bathroom cleaning? Bathroom cleaning isn’t easy for me.